This worked as a great fundraiser for a few non-profit organizations in Scranton, Pa. This game was used to fund an organization, but was still based around the town of Lakewood, NJ. You don't always have to stick to a town! This game was based around the entire county. Perfect for any size town! 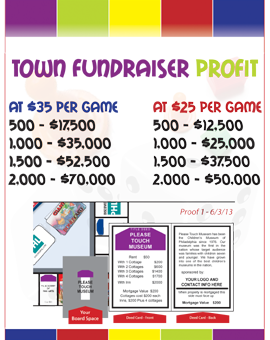 A custom opoly game is a perfect fundraiser for your town, school, event, organization, team or club. These games can produce anywhere from $17,500 to $75,000 PROFIT for your cause. Your organization will sell ad spots around the board (40 spaces) to pay for the printing and shipping of the games. This means that every game you sell is 100% profit. There are a few different ways to go about selling these games once they come in, we have a fundraiser packet that will help you with this along the way! Another option is 521 Promo will take care of all ad sales, PR, Marketing and proofing, your organization will just handle pre-sales and distribution. We know some organizations are in need of some extra funds, but don't have the time to put into a fundraiser like this. If that is you, this option will work best for you. Please contact us for pricing on both options. Either way you're sure to raise tons of money for your organization and everyone will LOVE the games! Contact us and receive your fundraiser packet today! Pricing depends on the qty ordered. Please contact us for our fundraiser packet and full price list. Just wanted you to know how well our Seaside-opoly game is selling. As I told you the season is over, but we are still selling them. I've had nothing but positive feed back on them. They look really great. I keep 2 boxes in my car and yesterday the gas attendant off the island and out of town saw the box in my car. He loved it and is buying one. Thanks again for getting us such a professional looking game.